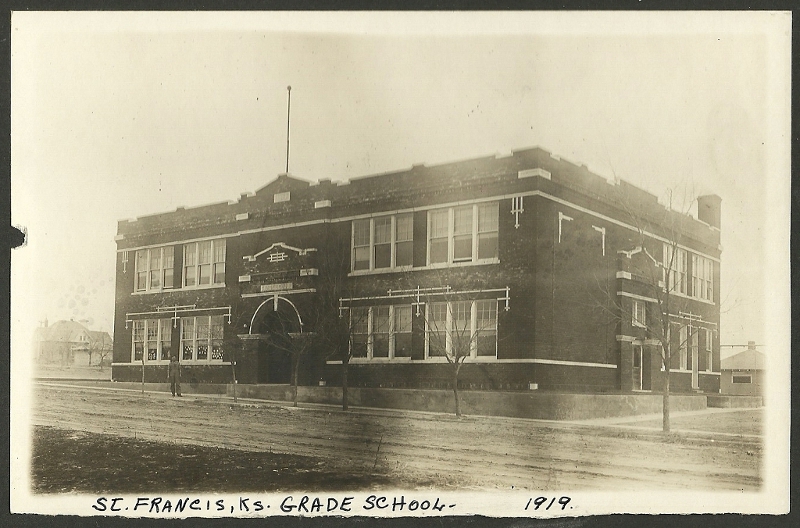 The accompanying photo of the old St. Francis Elementary School, which was erected in the late 1890's, probably 1898, was the birthplace of the first high school in Cheyenne County. It was a beautiful, artistic brick structure which complemented the above event. The building faced west toward Denison Street and was located in the area approximately west of the existing elementary building. The high school began in 1901 and offered a two-year program. It was established largely through the efforts of C.M. Kincaid, a graduate of Nebraska University, who was serving as principal of the elementary school. He was a school administrator with vision. In addition to promoting the first high school, he was a major influence in the establishment of a four-year county high school two years later. Instructors of the first high school were C. M. Kincaid, Florence Ward, Pearl Scanlan, and Lura Northrup. Members of the 1903 graduating class were Laura Armstrong, Ina Graves, Nolia Jaqua, Claude Tressel, and Maude Denison. In early 1903, the state passed an act for the creation of county high schools for those counties qualifying under the act. 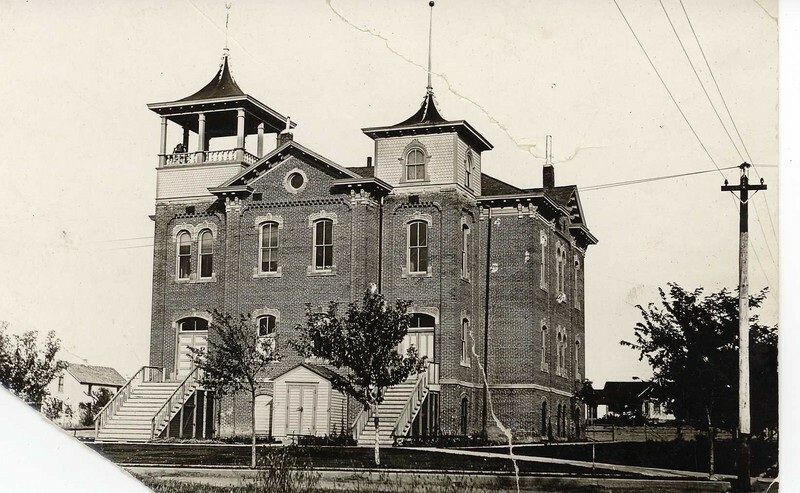 The provisions of the act were met by Cheyenne County, and in July of 1903 the commissioners gave approval for the establishment of the Cheyenne County High School in St. Francis. The first classes began in September, 1903. Faculty members for the first year were E.E. Colyer, Principal, Pearl Ross, Hattie Waters, and Pearl Scanlan. The first graduates of the County High School in 1907 were Charles Benkelman, Ben Harrison, Tessie Lawless, May Watt, Hazel Halley, Effie Walin, and Irene Moore. In 1917, a new high school was built at the present site of the existing high school on College Street. Classes were moved to the new building during the 1917-1918 school term. The first faculty members to teach in the new building were Leigh Dowling, Principal, Hazel White, Anna Daniels, and Josephine Jaqua. Robert Cram, a former teacher in the county high school, was serving as county superintendent. The course of study for the students during most of the years of the County High School was divided into three parts: a college preparatory program, normal training for those planning to teach, and a general program for those not wishing to specialize in a particular field. 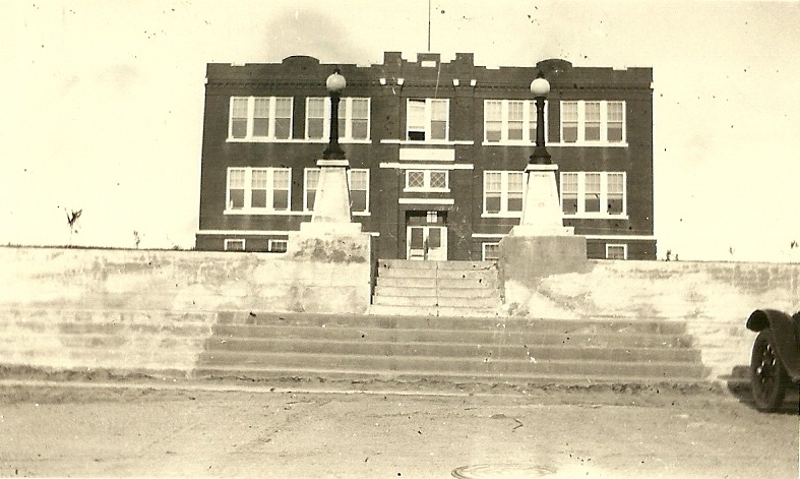 In 1917, a high school was started in Bird City and became organized as a rural high school in 1921. With the coming of rural high schools within counties, the county high schools began to become obsolete. 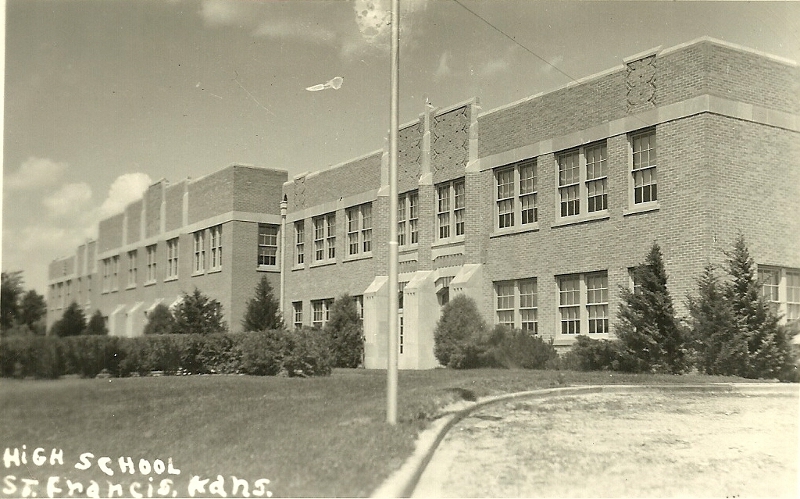 In 1923, the Cheyenne County High School was changed to the St. Francis Community High School under an act passed specifically for the transition of county high schools to community high schools. Cheyenne County was divided into two high school districts, a rural high school district for Bird City and a community high school district for St. Francis. The last organizational change affecting the high school came under the school unification act implemented in 1965-66. This act provided that all individual public school districts of sufficient enrollment and adequate facilities were to provide instruction of the students through the first twelve grades. The districts of the high school, city elementary school, and seven rural schools were combined into a unified district and designated as the St. Francis Community Schools, Unified School District 297. The boundaries of the district were substantially the same as those of the discontinued community high school district. The unified district's enrollment for the first term, 1966-1967, was approximately 740 students. Some remnants of the 1917 high school structure (red brick) are still visible; but over the course of over ninety years, several additions (and numerous internal renovations) have been made. A summary of the additions, and the years they were made, follows: 1932, classrooms and gymnasium; 1934, classrooms and an auditorium; 1952, an addition to the vocational agriculture department; 1956, a music department addition; 1965, a bond issue for an extensive new addition--including gymnasium, wrestling practice room, superintendent's office, cafeteria kitchen, and remodeling of the old gymnasium into a school cafeteria on the ground floor and jr. high classrooms on the second floor; 1974, new shops and classrooms for the vocational agriculture and industrial arts departments; 1976, a new school bus garage; 1992, a new athletic addition--including locker rooms for both home teams and visiting teams, a wrestling practice room, a weightlifting area, and a physical education/health classroom; and 2006, a new school bus parking garage. It would perhaps be appropriate and of interest, particularly to those who have attended the high school, to know the names of the high school principals and the years they served during the 110 years the school has been in operation. They are as follows: C.M. Kincaid, 1901-03; E.E. Colyer, 1903-06; C.F. Mueller, 1906-09; E.P. Curtis, 1909-11; E.L. Sampson, 1911-12; A.H.Neff, 1912-14 (the 1914-15 school term was discontinued due to the lack of students); Leigh Dowling, 1915-20; H.D. Klostermann, 1920-22; C.H. Cannon, 1922-23; Elmer Dressler, 1923-28; George Wilson 1928-30; G.E. Greene, 1930-57; Carl H. Sperry, 1957-66; Donald E. Hall, 1966-68; Richard L. Ahlvers, 1968-80; Ward M. Cassidy, 1980-2000; Scott A. Carmichael, 2000-2013; and David S. Morrow, 2013-present. Elementary school principals since school unification in 1966 have been as follows: Velma L. Zimbelman, 1966-1984; Larry B. Gabel, 1984-2006; Scott A. Carmichael, 2006-2013; and Robert A. Schiltz, 2013-present. St. Francis Unified School District 297 has thus far had three superintendents: Carl H. Sperry, 1966-1977; Carl M. Werner, 1977-2007; and Robert A. Schiltz, 2007-present. The high school began with a limited but appropriate curriculum and with a small but capable staff. It has maintained a strong curriculum throughout its history. In the mid 1930's, the high school was accredited by the North Central Association of Colleges and Secondary Schools, a mark of academic distinction. During the late 1950's to early 1970's, as the Space Age evolved, the curriculum expanded extensively; and as a result the school was accredited as a Comprehensive High School, the highest accreditation for Kansas high schools. In 1992, the Kansas State Department of Education initiated the Quality Performance Accreditation (QPA) system. Under QPA, all public schools were required to develop a School-Improvement Plan with emphasis on research-based instructional strategies, data-driven modifications, and continually better student outcomes (based on "triangulated data"). During the 1990s, St. Francis administrators, teachers, and other community members invested a huge amount of time and effort and paperwork documentation in the QPA process; and the St. Francis Schools emerged from each accreditation cycle with full accreditation and with high commendations from the visiting state evaluation teams. With the No Child Left Behind national education legislation in 2002, all Kansas public schools were required to administer Kansas Assessments to selected students in reading and mathematics each year and in other subject areas in designated years. The St. Francis teachers have led the St. Francis students to consistent excellence on the Kansas Assessments. The St. Francis Schools have exceeded the Adequate Yearly Progress (AYP) targets each year, and in many years both the St. Francis Elementary School and the St. Francis Jr.-Sr. High School have achieved the Standard of Excellence. Each year, a large percentage of St. Francis students have been awarded certificates for Exemplary Performance (the highest category) on the Kansas Assessments. In addition, in both 2006-2007 and 2009-2010, the St. Francis Schools received the Governor's Achievement Award for scoring in the top 5% of all Kansas schools on the Kansas Assessments. Records are limited on the early extracurrricular activities of the high school. Music emerged as a very early part of the curriculum and during World War I, 1917-18, the first high school band was organized. Football teams were organized in around 1915, and St. Francis had its first undefeated championship team in 1923. Players on some of the very early football teams were Merlyn Murren, John Ramsey, and W.R. Wilber; Merlyn Murren played on the 1923 championship team. Basketball teams were organized about the same time that football had its beginning. Wrestling teams were not organized until 1932. When schools began to form athletic leagues, St. Francis became a member of the Northwest Kansas League (NWKL) and has remained a member of that league throughout its existence. The St. Francis green-and-gold Indians have competed well against the other members of the NWKL--Atwood, Colby, Goodland, Hoxie, Oakley, Oberlin, and Quinter (and, in some past years, Norton and Scott City). For St. Francis, girls' athletics have included volleyball, basketball, and track; and boys' athletics have included football, wrestling, basketball, and track. More details about St. Francis team and individual records in these sports can be reviewed on the school website at <a href='http://www.usd297.org'>www.usd297.org</a>. In 2010, Colby and Goodland left the NWKL largely because of declining enrollments in the other six schools in the league; Dighton, Leoti, Sharon Springs, and Tribune joined the NWKL, beginning in the 2012-2013 school year; and in 2013-2014, Oakley left the NWKL and WaKeeney joined. Declining enrollment has also affected other aspects of the St. Francis Schools, including large funding decreases and reductions in staff. Available enrollment figures indicate that at the time of school unification in St. Francis, 1966-67, Grades K-12 head-count enrollment was 739 students (an apparent high for the district); enrollment has declined to a head-count enrollment of 296 in Grades Pre-K through 12 in the 2013-2014 school year. Simply put, St. Francis has had to adjust to becoming a small school because that is what we now are. This article for the most part has been one of legislative acts, statistics, and buildings. To the writer's regret, the humanistic aspects--staff, students, curriculum, and activities--during the many years of high school history have been only slightly touched upon. To do justice to each facet of the high school and its programs would require an article of much greater length. It is hoped that the statistics presented are accurate, or as much so as possible. When we reach back this many years, we find that records are sometimes missing, sometimes incomplete or vague, and that memories fade. The writer would like to express his appreciation to the many individuals who have provided bits and pieces of information for the article. Without their help, it would have been most difficult. The writer would also thank the Register of Deeds, the High School, the Historical Society, and the High School Alumni Association for access to their records and research. While looking for pictures for this site, we had the help of Sally Wieck at The Cheyenne County Museum, and Kent Kechter at USD297. And the some of the pictures on this site are from the Cheyenne County Museum, and the USD 297 website.